Now this is what I'm talking about. I can say with great confidence that Hulk vs. X-Force is my favorite of Jeph Loeb's run on Hulk thus far. This volume has a clear focus, a tight setting around an intriguing plot, and the "ambiguous mystery" angle Jeph Loeb fans know and love. All this set in a Marvel Universe which is not difficult for a newcomer to navigate. 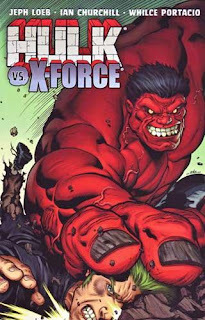 "Code Red" begins when X-Force member Domino accidentally sees Red Hulk transform from his secret identity into the crimson giant. Domino quickly escapes, and Doc Samson and Thunderbolt Ross provide Red Hulk with a team to track her down before she can blow the lid off Red Hulk's identity. The Punisher, the Crimson Dynamo, Thundra (recruited at the end of Red and Green), Elektra, and merc-with-a-mouth Deadpool team up against Domino, Wolverine, and the rest of X-Force over the secret of Red Hulk. When the Red Hulk is temporarily blinded by Wolverine, however, the new Red She-Hulk intercedes on her predecessor's behalf -- although her allegiances are far from clear, and the rest of Red Hulk's team may betray him as well before the night is up. The book concludes with a chapter detailing Doc Samson's mental deterioration, closing on the intimation that MODOK is about to rally pieces on the board for a major strike against as many Hulks as he can target. But the focal point of the book's ending is, of course, the "Lil Hulks" one-pagers by Audrey Loeb; as important as the Doc Samson chapter is for pointing toward the next trade, "Lil Hulks go to the dentist" is the plotline I never expected but now can't imagine life without. I've criticized the series for a lack of focus in the volumes following Red Hulk, but now that Bruce Banner is out of the equation, the book is clearly Red Hulk's -- and it's the better for it. Having to keep one eye on Green and one eye on Red was a little like watching a 2-D movie with 3-D glasses, somewhat less than the sum of its parts and more than a bit distracting. Overall, Hulk vs. X-Force is a much tighter trade than its predecessors, with a clear narrative thread revolving around a legitimate (and in-continuity) reason for some of Marvel's most recognizable characters to clobber each other. Additionally, as someone who came to these trades as a Jeph Loeb fan who knows almost nothing about the Hulk (the disconnect between movies didn't help, either), Hulk vs. X-Force introduces an important mystery -- not one grounded in continuity -- around which the story revolves. Or perhaps I should say "re-introduces." After a few collections, it seemed like the mystery of the Red Hulk's identity was just a MacGuffin, a way to get readers hooked on something that didn't ultimately matter (a bit like how, in Loeb's The Long Halloween, the identity of the Holiday Killer wasn't the most important narrative thread, nor was it ever fully resolved). But here Loeb reminds us very clearly that the character of the Red Hulk is one wrapped in mystery, a mystery which is not impenetrable but is nevertheless highly important to the character. It's actually a brilliant narrative move, resurrecting the mystery by wrapping a story around the mystery. Of course, we don't learn the identity of the Red Hulk. What we do learn is that Loeb is weaving a much larger tapestry of Hulk stories here. By the end of the volume, much as in the last one, the plot changes. Having already lost Bruce Banner, the series shifts from focusing on Red Hulk as a villain and repositions him as an antihero, betrayed by his accomplices and seeking revenge. The premise of this plotline is an engaging one, and with an unhinged Doc Samson apparently being manipulated by MODOK against Red, I can't wait to see what Loeb has up his sleeve. I haven't said anything about the art in this volume, although that's not meant as a slight to Ian Churchill and Whilce Portacio, who finishes the volume with the Doc Samson-centric chapter "Delilah." My only exposure to Churchill had been his Supergirl with Jeph Loeb, as well as a series of DC covers which always struck me as "Ed Benes lite." Churchill's style here is distinctly different from that "cut and rendered" work, dropping realism for cartoonish exaggeration a la Ed McGuinness. It's not a matter of aping the previous Hulk artist; Churchill is tweaking his own style to fit more appropriately what a good Hulk story looks like. There's nothing realistic about grotesquely giant men clobbering each other, and Churchill's style reflects that. Portacio's line's are more sketchy, but aside from a delightfully creepy MODOK and a beautiful poster-like double-page spread of Hulk fighting Doc Samson, the chapter is mostly forgettable. Overall, though, Hulk vs. X-Force is a satisfying collection, with a central storyline which represents a return to greatness for Jeph Loeb's run on Hulk. It's engaging, well-illustrated, and organized beyond what we've seen in the series thus far -- and we get several more wonderful installments of "Lil Hulks." In my next edition, the death of a major Red Hulk suspect kicks off a plot to overthrow the U.S. government, and with the world's smartest heroes missing in action, only the Hulks can stop it!